INASP’s Emma Farrow used her presentation at the 2015 LILAC conference to reflect on INASP’s new approach to Information Literacy (IL) training and how the organization focuses on building institutional skills for long-term information needs. Emma described INASP’s longer-term approach to IL training within the five-year programme, Strengthening Knowledge and Research Systems (SRKS). A key objective of SRKS is to strengthen the capacity of library consortia and member institutions in INASP’s partner countries to secure and manage access to the online research literature that their researchers and students need. IL training for library staff plays an important role in achieving this objective, training the trainers so that skills can be built within institutions. New and revised workshops for librarians within SRKS include IL Strategy, IL into Curriculum and Pedagogical Skills. All of these enable participants, and participating institutions, to develop and deliver their own Information Literacy training according to their needs. Training has been made more localized, new materials are easy to contextualize for different countries. INASP’s continuing assessment of outcomes and quality means that we are able to learn and adapt, improving the materials. Workshops are delivered by local and regional facilitators rather than flying in trainers from elsewhere. 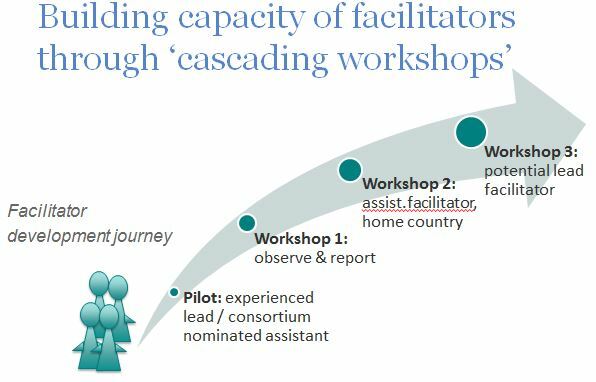 The ‘cascading workshop’ approach maximizes facilitators’ skills development and the spread of those skills, embedding them in institutions. An increased emphasis on participant selection, and the use of pre- and post-assessment tools informs facilitators and can be used to assess effectiveness of the workshops. Integrated post-workshop tasks (collectively agreed with participants) are then followed up six months after the training. These steps allow for flexibility and relevance of training materials, as well as enabling INASP to learn and adapt more quickly, resulting in more effective programming and materials. This approach is about working with consortium partners to determine their long-term needs, then equipping them with the skills and the tools to meet those needs. It is designed to build genuine and enduring capacity in Information Literacy within INASP partner organizations. Slides from Emma’s presentation can be viewed here. To follow the most recent IL training workshop in El Salvador please follow us on Twitter or use the hashtag #inaspLAM.